I love the TV series Lost. Not only is the plot captivating, but the scenery is fantastic. So while my husband and I were recently on Oahu, we wanted to find some of the key spots where scenes from Lost are filmed. It was really an adventure finding some of the places, almost like a treasure hunt. I thought I’d share some of the sites we found in case you would like to see them online or find them for yourself. Once we found this spot, we didn’t want to leave it. (For Google satellite view of this beach, click here.) We saw the survivor’s kitchen and Mr. Eko’s church structures. Filming had been stopped for the summer, so not many props were up, but it was still amazing to just stand there and soak it all in. How to Get There: First try to see if you can find the public beach access from off of Papailoa Road just off of Hwy 83. (February 2009 Update: See my detailed post on the easiest way to the Lost beach camp.) Take the public access to the beach and walk south along the shore. It appears that this way is the shortest distance to the camp site. We looked for this public access off of Papailoa Beach the first time, but couldn’t find it. On the second visit we did find the access and found it to be way shorter than the alternative from Hale’iwa Beach Park. There are several private homes here and they don’t make you feel welcomed by the plethora of “no trespassing” signs. We found what appeared to be public parking immediately across from the beach access. Don’t leave any valuables in your car here. We saw broken glass where a car window had been broken out. If you have trouble finding the public beach access off of Papailoa Road, then there’s a longer way, but a reliable way to find the survivor’s beach camp. Take Highway 83 towards Hale’iwa town and park at the northern most corner of the Hale’iwa Beach Park and walk north along the beach until you get to the area taped off by yellow tape or orange fencing. It will take you about 30 to 45 minutes to walk there. Always stay on the beach or beach access. Anywhere beyond that without invitation is considered trespassing. You will be walking in sand and over rocks, so bring shoes that are easy to slip on and off. Watch for turtles. We saw this guy sunning and taking a nap on the beach, plus we saw a bunch more body surfing. If you see one, look, but don’t touch. The area is guarded 24/7, so obey all signs and be respectful of the security guards. When I saw this area on Lost, I was blown away at how beautiful it was, so I really wanted to see it in person. It was a bit confusing trying to find it. We were told by a local to go the the Macadamia Nut Factory off of Hwy 83 just south of the Kualoa Beach Park. Unfortunately, the people at the store were grumpy and very unhelpful. So we tried walking along the shore line from the Kualoa Beach Park. We found a clearing from the beach and could see glimpses of the fish pond, so we followed the clearing where we were met by the magical view in the photo to the left. For a satellite view of this area, click here. How to Get There: We accidentally trespassed (sorry!) by following the clearing from Kualoa Beach, so don’t do what we did. We’ve since found an much easier (and legal :-)) way to see it. The Kualoa Ranch offers a $19 tour called “Hawaiian Fishpond and Garden Tour” (scroll towards the bottom of this link to find the tour and booking instructions.) I wish we had taken that tour. You can also book this tour in person at the Kualoa Ranch visitor’s center off Hwy 83 on the east side of Oahu. The Ka’a’awa Valley on the Kualoa Ranch was where Hurley made his golf course and found the old VW van. This was also the scene where Ben killed his father. This valley has been the backdrop for other movies like Jurassic Park and 50 First Dates. You can see these sites on a one hour Movie Sites and Ranch tour offered by Kualoa Ranch. Check out our review of the tour for more information. The mustard yellow houses of the Other’s community is at the YMCA Camp Erdman off Hwy 930 on the northwest side of Oahu. 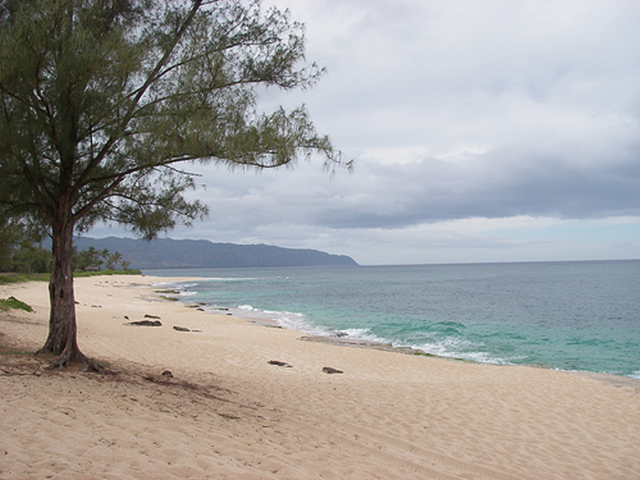 Several scenes including the crash site from the first episode were filmed at Mokule’ia Beach. This beach is right next to the YMCA camp. We also found a banyan tree that has been used in some scenes. This banyan tree is located between Turtle Bay hotel and Kawela Bay on the very northern tip of Oahu. If you stay at Turtle Bay Resort, you will receive a site map that will show the path to the banyan tree. If you are not staying at the resort, you may be able to ask for directions from the guard at the gate near the entrance next to the Turtle Bay Resort parking lot. From Season 5, we found the Rainbow Drive In where Hurley and Sayid grab hamburgers.It’s located in Honolulu near Waikiki Beach. Follow this link for more on finding and eating at the Rainbow Drive In. Sun’s father’s home in Korea, is actually the Byodo-In Temple on the east side of Oahu near Kanoehe. The waterfall where the survivors collected water is at Waimea Falls on the North Shore. This site is also where Kate and Sawyer shared a romantic swim. You could probably spend weeks looking for Lost sites. I’m glad I found the ones I wanted to see most. See our map of the top 3 locations where Lost is filmed. I also suggest purchasing a good map of the island. Have fun finding your favorite Lost scenes! Sheila Beal is the founder and editor of Go Visit Hawaii. You can connect with Sheila Beal on Twitter, Go Visit Hawaii on Facebook, or Instagram. This is outstanding. I can’t wait to use this on my next trip. Thanks so much, Brian! It was really a lot of fun finding these sites. I hope you get a chance to check them out for yourself soon! I was told that Lost begins filming again on July 25th. I actually mentioned the Indiana Jones filming in yesterday’s Hawaii Vacation News Roundup. I look forward to seeing the movie when it comes out next May. Lost is not in production right now, which is great for the Lost film crew because they are on the Big Island working on the new Indiana Jones movie with Harrison Ford, directed by Steven Spielberg. Im not sure who this message is going to but on 9th August 2007 I got married on Papailoa beach at sunset and sure enough there with us was the most magnificent turtle ever. This was my first trip to Oahu and we spent 3 weeks in paradise. Its now my aim to end up there, whatever it takes. It was interesting reading your information and I came across it by chance.. thank you. Aloha Michelle and thank you for sharing your comment and link to your awesome photos. That is so neat that you had a turtle attend your sunset wedding! Happy New Year from the UK. Thank you for you quick response, I hope you enjoy our photos. I know where we would rather be right now and its not the UK. We are aiming to return in 2009 and a visit to the other beautiful islands, a reason to return. We did however throw our large lei into the ocean back at Papailoa to symbolise our return and to our joy was another turtle. We will certainly look at the website more regularly, it will inspire us to follow our dream. This was a great help in finding the beach. We did find the public beach access to police beach. You walk left from there once you get to the beach. And you will see orange fabric fencing blocking it off. The security is very unfriendly and had a shouting fest with my gfriend for getting to close. Poor taste and extremely unprofessional the way the guy acted. I would report this guy if I could find a contact. But it was still great to see the campsite location. It appeared that the tent structures had been disassembled on our visit and were all laid around on the edge of property. On our visit to Oahu we did luck out and caught the film crew filming a scene with Desmond at St. Andrews Church in Honolulu. Camp Erdman is easy to get to on north shore where the Others Village is. They even have on the pavement sprayed which buildings were used as the others homes. Mokulea beach is near there the camp and is pretty easy where they filmed the first season crash site. The convention Center is also right there in honolulu and you can see the escalators where the filmed the airport scenes. Hi Mark – I’m glad you found some of the recognizable Lost filming spots. That’s too bad that the security wasn’t very nice. I wonder if the difference is that while we were there filming was not in progress. Thanks for reporting your experience! I took your advice looking for the camp today and found it very easy! As a matter of fact, they were filming Knight Rider on the beach to the right and to the left was the lost camp. The security guy was wonderful- he allowed me to take pictures and then invited me to come into the camp where I got my picture taken in the camp kitchen! The word is that Wednesday they are filming out at the camp! Great directions and thank you so much! This made my week and made my husband very jealous he wasn’t there! 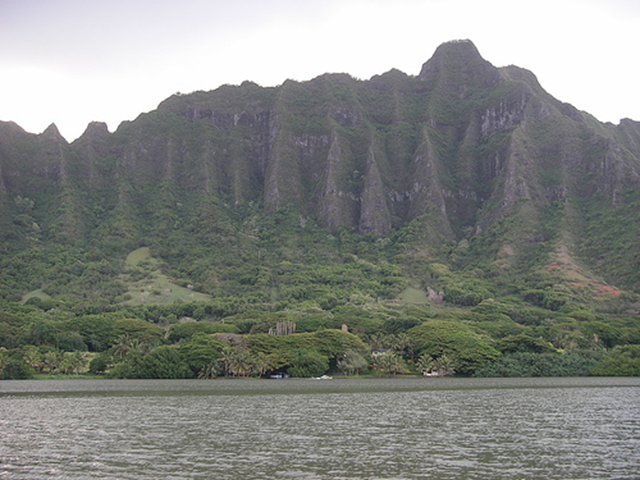 I currently live on oahu for the next 6 months or so…..and it would be really awesome to watch the filming of lost….anyone have any ideas on when and where they will be filming in the future? If you go to the beach- there is a 24 hour security guard. The older man is very nice and if you are very nice to him and talk to him- he may tell you when or where they are shooting. Typically two houses down from the beach to the left- they shoot other scenes from Knight Rider and Lost. When I was there they were taping in the evening and he invited me back and even let me on the set- Hope that helps! This site was VERY VERY helpful! I was visiting Oahu with a friend, and this site, along with the Lostvirtualtour site worked perfect. Thanks to the directions above, and our trusty car GPS we found the main beach with absolutely no problems. Everything in the camp was still set up, along with some props! We then headed towards Camp Erdman and lucked out even more to find the entire LOST crew filming on the beach! Dont want to give too much away but it looked like they were filming at a possible new village or camp! So that may be something to look out for, I do not know how permanent it is. But It was very exciting and the crew was extremely nice! They allowed us to drive right next to where they were filming and sit on the beach a distance away and watch and take pictures!! On the way back through a small town we also stumbled across more filming in a local store. Once again the crew allowed us to drive by closely, and even stopped traffic to film a scene right in front of our car! I was very impressed with the friendliness of the LOST crew and allowance of visitors watching the shoot. If you have a chance to catch filming or any of the locations I would highly recommend it! @ Corey – have you found any filming yet? @ Alayne – sounds like you hit the jackpot! How exciting to get to see some actual filming. Did you get any photos of the filming? Thanks so much for the great directions. We found it with no problems. It’s actually a very beautiful beach, I would have loved it even if I hadn’t seen the lost beach camp. The morning we went they happened to be shooting scenes for the season finale, so we got to see Kate, Sawyer and Juliet filming. we couldn’t get too close but the crew that came over to us said we could stay and watch from a distance which was very nice. we got a few pictures from afar which is really cool. We also saw them filming in Waimea Valley the morning before. The absolute best part was when I met Terry O’Quinn at Ted’s Bakery the first morning we were there. He is a truly nice guy, I recognized him right away and I was sort of in shock, but I said hello to him and told him I was a fan of the show and he came over and talked to me and my husband for a while. He took some pictures with me which was just so cool. A very down to earth , nice guy. Needless to say, we had a fantastic vacation. Hi Jennifer – I’m glad the directions helped. Wasn’t it an adventure to make your own Lost tour? You’re right – that is a beautiful beach where Lost is filmed. That’s fantastic that you saw filming in action. Do you have photos of that? It might be fun to feature one of your photos. I don’t know if I’d have the courage to utter a word to Terry O’Quinn. Kudos to you for having the nerve to do that. Nice to hear that he’s approachable. thanks so much for the directions. i am going to Hawaii in two weeks and will definetly be visiting those places. We found the submarine dock view right from kam highway when we were going towards chinaman’s hat. The Moli’i Fish Ponds are pretty much a breeding ground for piranhas. Plus that property all around it is PRIVATE so good job on trespassing. Maikai. I’m living on Oahu now. Any new info on LOST filming? I went on the 2 hour tour at Kualoa Ranch-Ed Kos in search of filming locations. I definitely need to make it to the beach, only one season of LOST left! 🙁 I hope the camp sites will still be around! @ Rebecca – I may be wrong, but I think filming is going on right now. I think it starts back up in the fall. Good luck in finding the sites. Will there be any kind of Lost parties or events for the series finale next may?? @ maggie – I haven’t heard of any yet, but I bet there will be. It’s probably too soon for those kind of events to be announced. Hi! Thanks for the info!! We went to the Other’s Camp and also to the Lost beach (the picture of the beach access sign was SUPER helpful!) When we were in the YMCA camp, there was camp in session and the woman asked that we sign in, for the securty of the kids. She was really nice and showed us a cuple of sites. While at the beach, we saw the orange tape and the security guard. There wasn’t much there and the securty guard wasn’t really talkative. But the beach was worth it and on the way back, we saw a family of sea turtles. One huge one totally hung out with us on the beach. Definately worth the trip! Thanks again! @ Jodi – Awesome! I’m so glad the picture helped. Let me tell ya, having gone both ways, that way is so much easier! The banyan tree was very easy to find. Open the ‘towel / room key’ holder which Turtle Bay resort Reception gives you and follow the trail – not hard to find and super cool to know they filmed here! Wow, I just started watching Lost and knew right off the bat where “police” beach is. I used to access the beach on that very same path between 2 houses back in 1990-1994 when the surf was big enough to ride! It’s a real spotty break and only rideable a few days out of the year but an awesome left. Hope it’s still a “secret spot” after all these years. Hi Tom – I hope you find these Lost filming spots easily. You may have to double back a few times, but we actually found it to be a fun adventure. One thing you might want to invest in is a proper map of Oahu. The “maps” that the hire car agency give you is actually a magazine with detailed maps strewn across the magazine and interspersed with ads. I’d guess that Oahu maps aren’t sitting on newsstands around Scotland. 🙂 So, I checked amazon.co.uk and they sell the map that I’ve used on multiple trips to Oahu. It’s the Nelles version. One thing I did that helped before we set out to find these Lost sites was to first find them on the map and highlight them. Hope this helps…let us know how it goes. Hi, I was wondering if anyone knows where filming for Lost is at right now?? I heard they are filming here in Oahu right now and I also heard that there are going to be a couple of events for Lost going on in mid-October…Will the entire cast be there as well?? 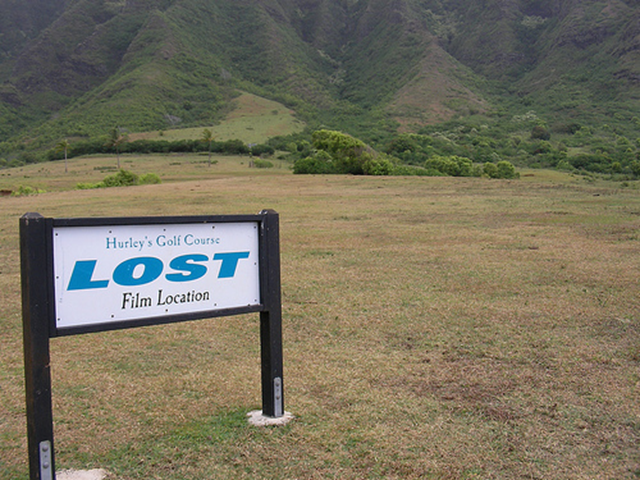 I saw the Lost crew filming in Manoa Valley by Nehoa Elementary School. They’ve been there for a couple weeks…. My wife and I went to the beach “crash” site yesterday. Your directions were PERFECT, we walked right to the spot, and my wife didn’t even realize we were there until I pointed out the plane parts. The only thing that would have made our trip SLIGHTLY easier would have been having a town name to put into the GPS – but perhaps I missed it in my reading. We also went to the YMCA Camp, which was strange. They shoot it to look very different for the show, in my opinion. My wife and I spent the week at the Turtle Bay Resort for our 30th anniversary late in Aug-09. It was absolutely “the best”. We went on two LOST tours, but enjoyed our own excursions the best. Turtle Bay grounds hosted many filming locations. Walking through the Camp Erdman grounds on our own was a rush (technically trespassing). I want to go back again. I’ve identified many other locations I’d like to see. I found one of the Dharma building used in season 3 disc 2/3 the building where alex’s boyfriend was being held and the Dharma “flame” communications center. On Oahu. Any questions (808) 779 4690 feel free to call if you need directions i won’t be coming back to this site just thought i could help. Going to Hawaii in a few weeks. Thanks so much for what appears to be an excellent guide. I’ve printed it and I’m taking it with me! Is there much to see here now? Police Beach crash site and so on? I have every intention of exploring the area, but I am wondering what to expect and what identifiers remain. Nancy, I was just there on the North Shore last week and wish I had the time to go check out Police Beach to see if there were any camp remnants. Even if there aren’t, I think you’ll find that the scene still looks familiar. Be sure and follow the directions for the quickest way to the beach camp: https://www.govisithawaii.com/2009/02/18/easiest-way-to-find-the-beach-camp-where-lost-is-filmed/ It’s only about a 10 minute walk to the site of the beach camp. All the other landmarks should look somewhat familiar even without the props. Hi Sheila! I came across your blog just in time to start planning our trip to Oahu in Sept! This information is fantastic. I am a huge fan of LOST and plan to use your tips on a driving tour. Obviously the show is no longer on air and I’m assuming the sets are gone, which is fine. I’m wondering, to your knowledge, is the above info still good? Will I still be able to access the survivors’ camp etc? Hi Meredith – yes, everything in the article is still accessible today. And if you take the submarine down off Waikiki, you can see a crashed plane down there that was used in Lost. It’s 2016 now, how much of this is still around? I am going Jan 21-28th and would like to see as much Lost stuff as possible! Any guided tours? The filming locations are all still in existence. You may recognize them just from the surroundings you saw so often on the show. There just aren’t any props and sets for the show. There used to be a LOST guided tour, but I don’t know if they still run or not. Which is the Best Hawaiian Island to Visit for Your Vacation? Go Visit Hawaii has been providing award winning Hawaii vacation travel advice since 2006. We cover Hawaii travel tips, news, and reviews for planning your perfect Hawaiian vacation.